Cryptid is a pure deduction game from Osprey Games and designers Hal Duncan and Ruth Veevers with art from Kwanchai Moriya. In Cryptid, you play as 3-5 competing cryptozoologists searching for the eponymous elusive creature. Each player’s “research” has provided them with one clue about the whereabouts of the beast. And while the mysterious creature is secretive, it is nowhere near as secretive as science! If players were to work together they could easily determine the beast’s location. However, since they are a very competitive lot, they don’t want to give too much away to the competition. But in order to keep professional connections alive, you are going to share just enough information to remain honest without giving too much away. Eventually, one player will be able to suss out the correct location of the beast, stake a claim on it, and win the game! The set-up for Cryptid is simple. Players choose between two different modes -- Normal or Advanced. For your first couple of plays or when introducing the game to new/younger players, I recommend using the Normal Mode. It simplifies the clues and reduces the number of structures on the map. After deciding on the mode, choose a random setup card. There are two types of cards -- light and dark bordered. Choose the light-bordered cards for a Normal Game or the dark-bordered cards for an Advanced Game. Either way, the card determines how to orient the six hex-map tiles, where to place the structures, and the clue each players will get. To determine the clues, each player will get a different “research journal” designated by the Greek letters (alpha, beta, delta, gamma, and epsilon), and find the numbered clue indicated on the card. After everyone has their clue, put the card aside. It can be used again later in the game if the players are stuck and need a hint. Then each player will take a turn placing a cube in their color on a map hex indicating an area which is devoid of cryptids according to their clue. The map is set and now we begin! There is only one hex location on the map that aligns with all the clues and reveals the cryptid. On their turn, players are going to try to suss out their opponent’s clues in order to zero in on the location of the cryptid. They do this through one of two actions -- Questioning and Searching. When questioning, the active player picks a hex location on the map, places the pawn there, and chooses another player to question. They ask if the cryptid could be at that location according to their clue. If the answer is yes, the questioned player will put a round disc in their color on the hex indicating a possible location for the cryptid. If the answer is no, they place a cube in their color and then the active player has to also place a cube somewhere on the map (corresponding to an area that the cryptid can not be according to their clue). In this way, the map will begin to be fleshed out and players will begin deducing the other player’s clues and the location of the cryptid. Once a player is fairly confident (or just feeling particularly daring), they can Search a location. To search a location, the active player first places a disc on the location confirming that according to their clue, the cryptid could be there. Then, moving clockwise, each player in turn will place a disc or a cube. Once one player adds a cube, the search immediately stops, the active player has to add a cube somewhere on the map, and the turn ends. These are tricky because they provide a large amount of information for everyone at the table. So be careful when you attempt a search! Deduction games are a tough sell for me. They tend to bring in too much meta-gaming and really the winners are those who can either lie really well or can logically puzzle out someone's actions. The playing field never feels particularly level and that leads to frustration. I'm reminded of one person's strategy of yelling "ARE YOU THE WEREWOLF!?" at random people to see if they would crack during games of Werewolf. Sure, it’s a strategy but you are also a horrible person. 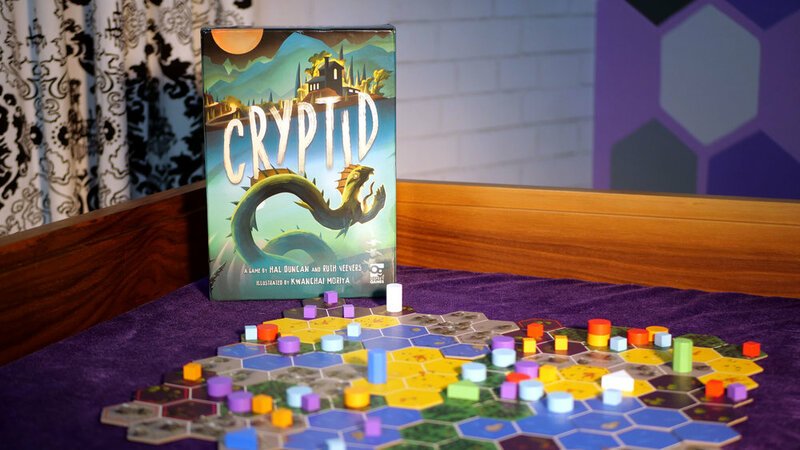 Cryptid feels like a shared puzzle where pieces are slowly tumbling into place for everyone and racing to figure out the puzzle first without giving too much information away. In this way, Cryptid is a much more gentle, subdued experience. You never feel tricked or cornered or baffled. Players aren’t out-smarted, just maybe outpaced a bit. The gameplay isn't about lying or bluffing or rattling someone until they crack. It's about the subtle furnishing of information and misinformation. The asking of the right question. That is the heart of Cryptid -- providing the least useful piece of information while sussing out patterns in your opponent's answers. The art is simple and direct. The stark colors and severe shapes help make sense of a potentially busy and confusing tableau. Cryptid is a wonder of user experience design. Too much art and it could be distracting. Not enough art and the board becomes boring. There was a happy medium that Osprey Games struck when they produced this game and it deserves more recognition than it currently gets. While the gameplay is gentle, the pacing is certainly tense. At the start of the game, it feels almost lackadaisical. One clue doesn't mean much but suddenly, as it builds up, clues can strike an obvious pattern if you aren't careful. Then, as the tension increases and the map closes up more, the chance for long, agonizing, turns increases. Especially when there are only a few open spots left on the board for you to sweat over. Cryptid, play it because it is good. You can order the game on Amazon and we’ll get a little kickback if you do! John is a gameslut librarian with a passion for being goth.